Usually comets are small bodies, typically about 25 kilometres across, consisting of frozen gases and grains of dust and rock. It is when comets approach the inner Solar System and become subjected to the Sun's heat, that they develop a tail millions of kilometres long and thus become very large objects. Many comets remain too faint to be seen with the naked eye, but a few become so bright and spectacular they dominate the sky and enter the historical record. Comets have been known to civilisations for thousands of years, and were often regarded as messengers of doom or upheaval. Comets have very elliptical orbits - they come very close to the Sun, and then travel to the outer Solar System. Nor are their orbits restricted to the plane of the Solar System - they come in at a variety of angles. Comets can be divided into short-period and long-period orbits. Short-period comets have periods of less than 200 years, whereas long-period comets can take up to a million years to complete just one orbit of the Sun. This implies that long-period and short-period comets have a different source. Current thinking is that short-period comets reside in a belt, the Kuiper Belt, located between 4000 million and 7000 million kilometres from the Sun. 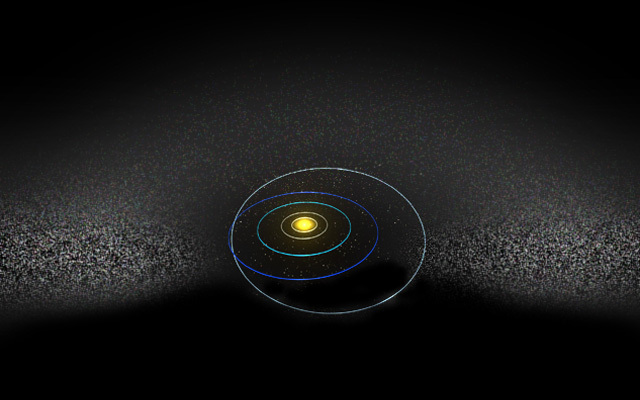 Long-period comets are proposed to come from the Oort Cloud, at a distance of 3 million million kilometres. This distance is more inter-stellar than planetary. The nucleus of a comet is usually very small, in the region of 10 kilometres across. The nucleus is similar to a dirty snowball, a mixture of frozen water, frozen gases, and grains of dust and rock. When a comet is far from the Sun, temperatures are so low there is no evaporation from the nucleus at all. At such great distances the Sun appears as a bright star, and provides no heat. Reflected sunlight is minimal, and the comet cannot be seen. As the comet swings towards the inner Solar System, the Sun starts to heat the nucleus, which develops a surrounding diffuse cloud as the surface material begins to evaporate. 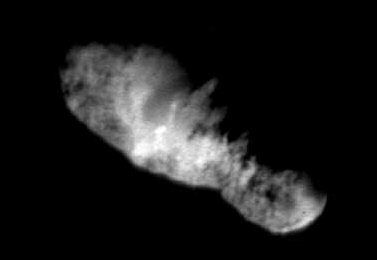 The cloud is known as the coma, and when a comet is in this state it starts to become visible to major telescopes. This process starts to occur when the comet is within 500 million kilometres of the Sun. As well as reflecting sunlight from the larger coma, the comet also reacts to the Sun's ultraviolet radiation by fluorescing. Fluorescence becomes a greater light source than the reflected sunlight, and this is why many comets are first detected when they have produced a coma. As the comet continues its journey into the inner Solar System, it falls more and more under the influence of the solar wind. The solar wind forces the material surrounding the nucleus, the coma, away from the comet to form a tail with a length measured in millions of kilometres. In fact, two tails are formed by the pressure of the Sun's wind and radiation. One tail consists of the more massive material, dust, and as this material accelerates slowly it forms a tail that is curved. The second tail consists of ionised gases (where electrons have been stripped from the atoms). 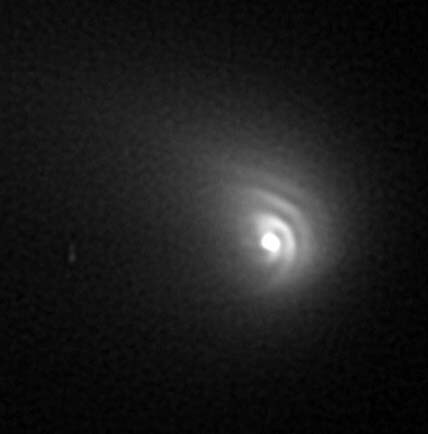 The second tail has a lower mass and is accelerated away from the nucleus more rapidly. The ion tail is therefore straighter than the dust tail. 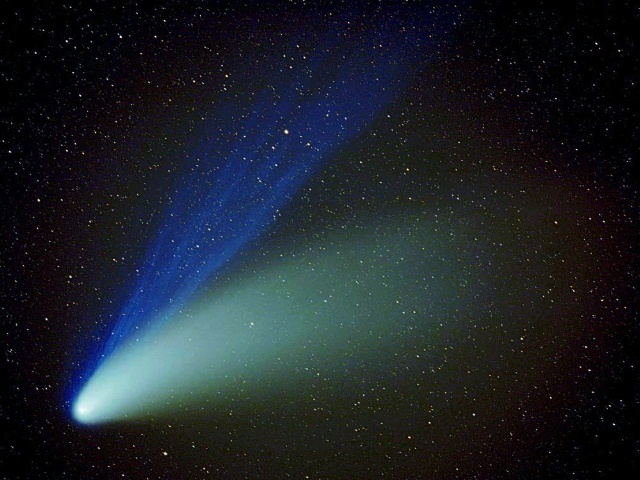 One of the long standing questions of astronomy has been: where do comets come from? It is now apparent that there are two main sources of comets - the Oort Cloud and the Kuiper Belt. Long period comets, those which have return periods of more than 200 years are concentrated far beyond the outer planets. 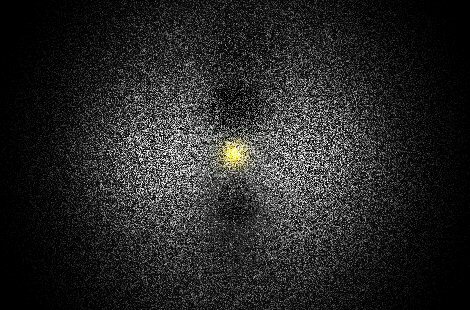 They are concentrated in what is called the Oort Cloud after the Dutch astronomer Jan Hendrik Oort. He built on the initial discovery by Isaac Newton that comets have parabolic orbits. Oort realised in the 1940s that comets are preferentially located in a disk shaped cloud at the edge of the Sun's gravitational influence. The gravitational pull of the Sun is so weak here that passing stars, which may go by on time scales of millions of years, can change comet's orbits and produce random effects. Long period comets include Hale Bopp and Hyakutake. They appear to visit the inner Solar System on hyperbolic trajectories which are more randomly oriented than those of short period comets. Long period comets can have aphelion distances of 3 million million kilometres and periods of up to a million years. Short period comets like Halley have periods of less than 200 years. In 1949, Gerard Kuiper thought that these might be concentrated at a distance of about 4,500 million to 7,500 million kilometres. Until 1992 the idea of such a ring or belt, referred to as the "Kuiper Belt", was just theoretical. In 1992 David Jewitt and Jane Luu found the first Trans-Neptunian Object (TNO), 6,600 million kilometres from the Sun. It was a faint object, (magnitude 23), and given the asteroid designation 1992 QB1. It is an estimated 320 kilometres across, irregular in shape and reddish in colour. Its orbit is not very eccentric and it is inclined by just 2.2o to the plane of the ecliptic. Since then, many more TNOs have been found. About 10 a year were found for the first few years, but the rate of discovery has accelerated dramatically. By the first half of 1999 more than 180 TNO's had been found with at least 70 discovered in the first six months of 1999. There are an estimated 35,000 Kuiper belt objects, 100 to 760 kilometres across, orbiting the Sun at a distance of 4,500 million to 7,500 million kilometres. There are very likely many more beyond.